Next up in my Dancing Maries series is this lovely creature that resembles a Magical being. 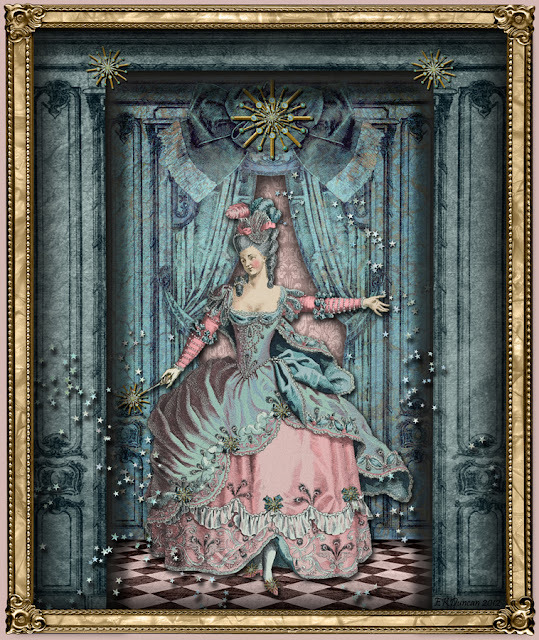 Here I have created a whimsical stage so she can be the Fairy Queen of France. After all... Who can resist the mystique that was Marie Antoinette? Marie Antoinette herself, she does represent her quite well. 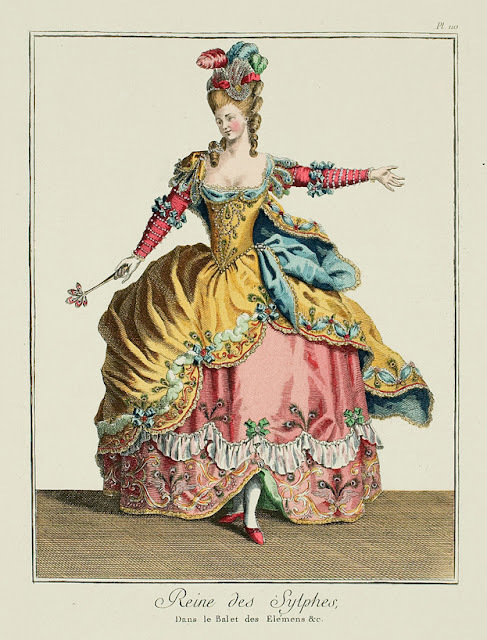 I started with this original image of a Late 18th Century "Opera Costume" fashion plate. choose the lovely pink and blue one for my digital art-piece. Here is the assortment of png images I created from the original. are all the fun bits from PaperWhimsy. There is a great "doorway" image that I used in whole in the background and then an adapted portion to the front as a secondary "frame" for my Marie. 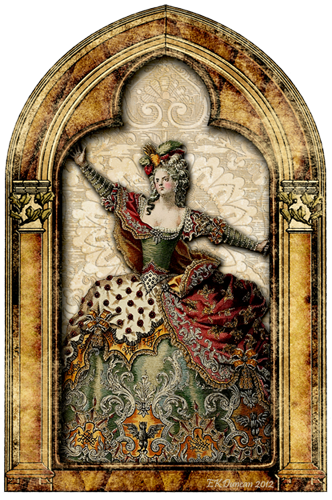 The background behind the curtain and the floor are PW backgrounds, I altered in both color and shape to work with my piece. Next up is the "magic" the jewels and stars that are scattered about for that extra special bit that turns makes her the "Fairy Queen". I really have a fondness for the images at PW and seem to use them quite frequently in my digital art creations. I hope you get a chance to check them out and hopefully find some "magic" pieces for your own collection too. 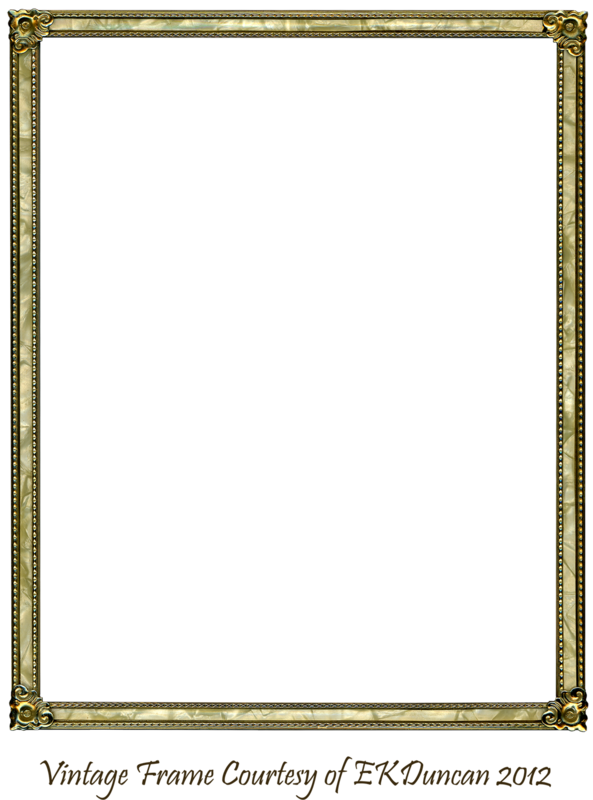 Finally the last touch on my digital piece is the frame. Yup, this is another one from my personal collection of vintage frames. Another absolutely stunning piece of work Evelyn, love how you integrated Marie in your gorgeous background! I really love the fairy quality of this "Marie" and one by one I just kept adding all the fun PaperWhimsy items till I had this finished look. Welcome BLISS angels! and thanks for the kind words. Laura was a real sweetie to spotlight me on her blog. I'm so glad you dropped by and are finding some fun images to play with. I love posting about old treasures like these antique fashion plates and am glad to share. Laura Carson posted about your blog on her's and I just had to come by and peek at your beautiful work. Well, now I'm a follower! Thank you so much for the beautiful images and the instruction you offer. You are truly a lovely, generous person! I'm so glad you followed me over from Laura's site and welcome. I love to share and am so glad you are enjoying my little "treasures". I hope you get a chance to make some fun projects using some of your favorites. 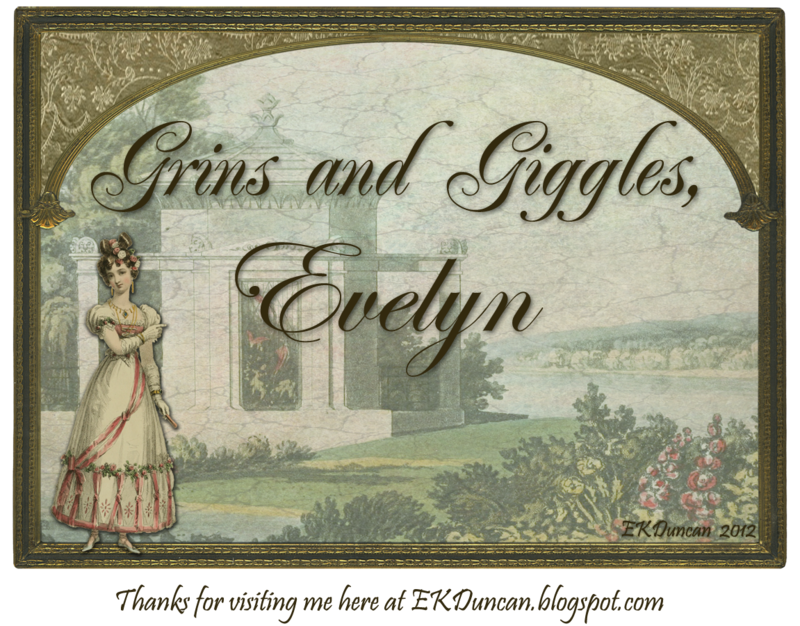 Hello, Evelyn! They're soooo so pretty. Thank you again. You must spend HOURS on these, they're so lovely! Hi Sheila A and Thanks, I think they are pretty too - giggles. Ya, guilty - I do spend a lot of time playing in Photoshop but it's just so much fun!!! I hope you get a chance to play with some of them too. Hello Evelyn! Today was another treat for us to see. I love seeing what you are doing with the Marie inspired pieces. So beautiful!! Glad to see you featured on Laura's blog too. Thank you for sharing your labors of love!!! I'm so glad you are enjoying another installment of my Marie journey. I've got a few more still to come and I hope you like them just as much. Ya - Laura was a real sweetie to "spotlight" me on her blog ArtfullyMusing. She has a generous heart! Thanks for dropping back in and for letting me know you are enjoying the "show"
Oh what fun, fun, fun - BLISS angels! Your Marie creation is great. I love it when people post back to show what they created using this piece or that. I'm so glad you are enjoying the images. I love, love, love very much! It must be a lot of work with everything you publish on your blog. What's more, it's beautiful ... and I would have loved to wear such beautiful dresses! Thank so much! Have a good and beautiful weekend. I'm glad you are enjoying the new "Marie" series. 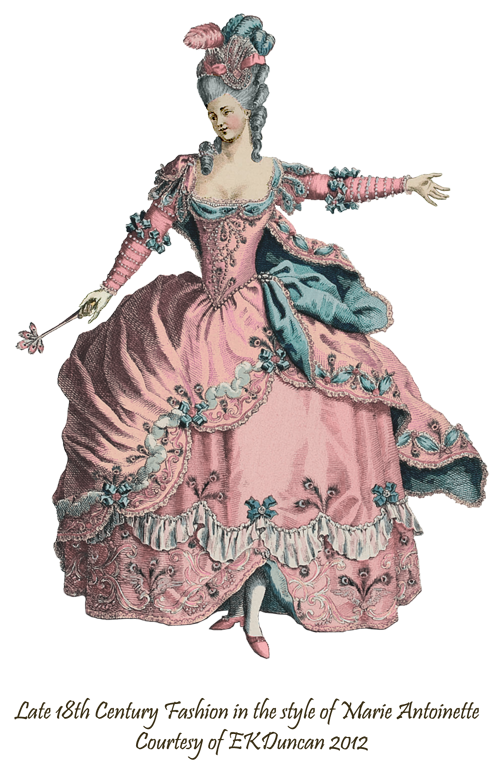 Yes - these dresses are amazing but I'm sure they had to have been hard to wear all the time too. Still, I would not mind it for a day or two. I'm another one who's been introduced to your blog through Laura's blog. You have such beautiful images and the artwork you create with them is stunning! I'm so glad you dropped by to spend a little time with me. Thanks so much for letting me know you are enjoying my posts and I hope you get the chance to play with some of the images yourself. You have some of the most wonderful images here on your blog. Going to check out your deviant art page. Thanks for sharing your amazing talents! I hope you continue to enjoy the images here and at my deviantART account.